Happy, happy New Year!! I am SOOOO excited to start this year off with a giveaway!! This giveaway is a goody so get ready to enter! Cutting Edge Stencil contacted me and asked if I wanted to try out their stencils and then offered me the opportunity to give one away….I couldn’t resist! This is the wall in my bedroom that I used my stencil on. You can read about it all here. The whole stencil process was made relatively easy by this how-to video available through Cutting Edge Stencils. Check out their website for the complete selection. -Cutting Edge Stencils is offering one of my readers one stencil of any value up to $50. -Giveaway is open from January 2nd through January 9th – 9:00pm EST. -One winner will be selected using Random.org and will be contacted via e-mail Tuesday, January 10th. Make sure you leave your e-mail address so I can contact you if you win. -Visit Cutting Edge Stencils and tell me which stencil you would like. -Like Cutting Edge Stencils on Facebook. -You can also Follow Saving4Six on GFC, “Like” Saving4Six on Facebook, or subscribe by e-mail. (Just leave a separate comment for each). Please leave a separate comment for each entry and make sure you leave your e-mail address so I have a way to contact you. I like the “spring songbirds” wall stencil! I love the The Georgian Ceiling Medallion Stencil, how neat is that idea!? Flower Power Stencils would be perfect for my daughters room and the toy room or the Funky Wheel Wall Stencil for my craft room! I like the Flower Power stencil. I liked them on facebook. I would love to get the Wise Owl Stencil. We are having another little girl and that would be perfect for her room! LOVE the paisley allover stencil!! Beautiful! 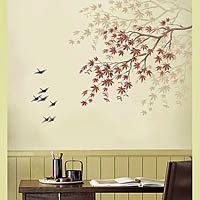 I love the’ Sakura and birds” wall stencil. I’d love to put that in my little girl’s room! Oh how beautiful! I’ve thought of buying the vinyl stickers of the tree for our nursery, but can’t stomach the possibility of having to move and not being able to move it. But a stencil. . . now that I could use over and over! And I’ve liked Saving4Six on FB, too. I connected with you via GFC. I forgot to add my email crapinola@yahoo.com. I liked you and Cutting Edge Stencils on FB, my favorite is vintage paisley. Love these! I would love the Hermitage Acanthus stencils for my kitchen backsplash : ) Thank you so much for this opportunity. Oh how fun! I liked Cutting Edge Stencils on FB. I really like the Japanese Maple pattern. I "liked" Cutting Edge Stencils!! my e-mail is chantellejrogers@gmail.com…I forgot to leave it on my comments…sorry! I Love the Japanese Maple Pattern. It is absolutely Stunning!!! I love the designer series. Wow…the Powder Room mural was amazing…fancy!!! The vining stencil you did in your house looks amazing, Carrie! Love the way it turned out! Oh, there are so many gorgeous stencils, it's difficult to choose! I really like the tree/branch stencils that feature birds. Though if I won, I'd probably pick out an Asian-inspired stencil for my sister as she loves cherry blossoms and is getting ready to move into a new house. She would love having a cherry blossom motif on her bedroom wall! Oooh, it's hard to decide! But I think I'd have to say the Japanese Maple Branch is my favorite! I likes Cutting Edge Stencils on FB! I love the Chrysanthemum Grande Flower Stencil! Found you on Someday Crafts and am now following! I like the Bon Appetit! Large wall stencil – I've got a kitchen wall that's screaming for this! Oh my goodness… so many to choose from. I would have a hard time picking just one. I LOVE those fresco and mural sets! If I have to name one that I really like, I pick: JAPANESE MAPLE LEAVES 6PC STENCIL SET – SO BEAUTIFUL! I love the 'Freedom!' birdcage stencil, thanks for the chance to win! I would buy the Kerry Damask Stencil for my dining room! I liked them on FB. I like the Casablanca Allover Stencil. love love love the Japanese maple branch! Oooh.. I really like the dandelion stencil! The Connection All Over one is really cool too! I love the floral filigree wall stencil. I lOvE cutting edge stencils!!! I’ve spent waaayyyy to long looking at their stencils…to just choose one is so hard! I’m loving the BIRCH FOREST ALLOVER STENCIL! I would love to use this stencil in my bathroom! I “like” Cutting Edge Stencils on Facebook! I’m a new follower of Saving 4 Six! I really like the FLORAL FILIGREE WALL STENCIL. Love the POPPY ALLOVER STENCIL!! I like the vintage paisley stencil. I love the floral filligree! I like saving4six on Facebook. I liked Cutting Edge Stencil on fb. My fave is the Harlequin Trellis Allover Stencil. I love the Alladin Stencil! I like the Simple Rhyme Allover stencil. I really want to try this!!! I like Saving 4 Six on FB! I LOVE 4 of these stencils, but to NOT be too selfish, I like the Sakura & Birds for my DD!! I have “Like”d Cutting Edge Stencils on FB. I have asked you to come into my email box every day because you are AWESOME!!! !